The Blue Train depot is situated in the Capital City of Pretoria, known as the City of Tshwane. Pretoria is also known as the Jacaranda City due to the large number of Jacaranda trees that are planted on its streets, parks and gardens – a true spectacle to be enjoyed in full bloom during South Africa’s spring season (September to November). Your holiday begins the moment you step into any of The Blue Train’s pre-departure lounges in Pretoria or Cape Town. Guests check-in at least an hour prior to departure. Morning beverages of teas and coffees, water and fruit juices are served in the Pre-departure Lounge. Pre-departure snacks, fruit and all other drinks are available on the train upon boarding. The Pre-departure lounge in Pretoria is in the vicinity and is a few metres away from the Gautrain Pretoria Station. The Gautrain is South Africa’s premier rapid rail and bus service which provides a fast, safe and cost effective link between O.R. Tambo International Airport (ORTIA) and nine key business hubs between Johannesburg and Tshwane (Pretoria), including Sandton. The Blue Train’s Pre-departure Lounge in Cape Town is nestled up at Cape Town railway station, the main railway station of the ‘Mother City’, as the city of Cape Town is affectionately known. The Blue Train travels this 1600 Km (994 Miles) journey in just 31-hours, and is ideal for those visitors who have shorter itineraries in South Africa. Southbound, the off-the train excursion (weather and time permitting) include the diamond town of Kimberley where one can explore the Big Hole and the Diamond Museum. Northbound, guests visit the historical town of Matjiesfontein where the Victoria buildings and original nineteenth century London lampposts impart to the traveller, the uncanny sense of entering a colonial time warp – an oasis suspended in a different age. The Blue Train also travels to South Africa’s Limpopo Province, which is home to the Kruger National Park, one of the world’s finest game parks, and home to Africa’s Big Five. These one-way 19-hour journeys take place on selected months of the year, and offer guests an opportunity of some fantastic new “rail safari” combination packages with the many private safari lodges found in the Greater Kruger and Sabi Sands areas. Departure times are 15:00 from either Pretoria or Hoedspruit Stations. Arrival times are at 10:00 for both Pretoria and Hoedspruit. Check-in is an hour prior to departure. All applicable meals and drinks are included in this experience. The Blue Train prides itself on the fine cuisine it offers its guests with meals that are accompanied by a wide selection of South African wines sourced only from some of the finest boutique vineyards. The wine list has for a number of years secured the Annual Diner’s Club Award of Approval. There’s a menu for every taste. Whether you require Kosher or Halaal meals, or gluten-free vegan options, simply make your needs known at the time of reserving your passage. With the exception of Caviar, French Champagne and external telephone calls, everything else on-board The Blue Train is included in the all-inclusive rate. Check-in is at 07h30 (an hour before departure) and guests can relax and enjoy pre-departure snacks and drinks. The train departs from both Cape Town and Pretoria at 08h30, arriving the next day at approximately lunchtime. The Southbound (PRY – CPT) off-train excursion is at the Kimberley Diamond Mine Museum and the largest man-made hole on the planet. The Northbound (CPT – PRY) off-train excursion is at Matjiesfontein (the entire village is a National Museum retaining its Victorian history). In keeping with tradition it is a compulsory custom to dress for dinner. Evening wear is elegant and gentlemen are required to wear a jacket and tie or traditional attire. During the day dress code is smart casual. One train set has a suite that is adapted for wheelchair users. A customised wheelchair on-board The Blue Train has been specifically designed to negotiate the train’s corridors. A butler will be on hand to assist guests should they require. Sipping bubbly in the bath and watching the changing vistas through the panoramic window as the train makes its journey through wide open farmlands, rugged mountains, semi-arid desert, dams pink with flamingoes, Cape Winelands, gold and diamond mining landscapes, an abundance of wildflowers and of course Table Mountain. 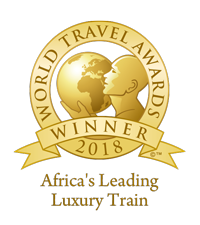 Africa’s Leading Luxury Train 2018 World Travel Awards (winner for 10th consecutive year). World’s Leading Luxury Train 2011 World Travel Awards (the eighth time it has won). Gold in 2010 and silver in 2012 in the Condé Nast Traveller Readers’ Awards in the Favourite Specialist Train category. Children 5 years and younger sharing a bed with their parents travel free of charge (up to a maximum of two children per suite). Children between 6 and 11 pay 50% of the adult rate, in a separate suite. Children 12 years and older pay the full adult rate per person sharing and will be accommodated in a separate suite. Please contact us for the full child policy terms & conditions. The distance between Cape Town and Pretoria is just under one thousand miles and The Blue Train does the journey in roughly 27 hours. The table d’hôte and vegetarian menus are prepared using only the freshest ingredients according to the seasons, and the areas through which the train travels, to introduce our guests to the best of South African cuisine. WHY CHOOSE THE BLUE TRAIN?WHY CHOOSE THE BLUE TRAIN? Voted Africa’s Leading Luxury Train for 10 consecutive years by the World Travel Awards. Far more enjoyable than spending time between cities, queuing at airports. Great value: 31-hour ‘forced relaxation’ on the Pretoria to Cape Town route – inclusive of 24-hour butler service, all meals and drinks, off-the-train excursions (weather and time permitting), minimum laundry service, cognacs and genuine Cuban cigars. The Club Car Lounge, situated at the front of the train, is the only area on the train where smoking is permitted. The lounge boasts a well-stocked bar, coffee table books, magazines and board games. The Lounge Car is a non-smoking lounge in which to relax and enjoy High Tea and snacks. The Dining Car seats 42 people and serves meals in two optional sittings. The Observation Car at the rear end of the train has windows on three sides for maximum enjoyment of the passing scenery (available on most departures). Boutique selling souvenirs and gifts. A limited on-board laundry and valet service is available. All accommodation aboard the Blue Train is en-suite, featuring either a private shower or bath. Guests may choose between a De-Luxe or a Luxury Suite. The De-Luxe suite has a choice of twin or double bed with shower or bath en-suite, while the Luxury has a choice of twin or double bed with bath en-suite. Luxury suites are equipped with CD Players and video machines. By day the elegantly furnished suites provide a generously comfortable lounge. As night falls they become subtly lit, en-suite bedrooms, with fine cotton linen. Room service is on hand at all times, provided by the professional butlers who attend to each carriage. Luxury suites are the premier suites and measure 10.26 sqm of space. They have a Blu-Ray DVD player and offer twin beds or double beds with full-sized baths. The same suite is also a lounge area by day and is converted into a comfortable bedroom during the night. Fully remote controlled facilities – blinds etc.